Integration of external line of business data is one of the hottest topic in each and every SharePoint project. Many issues still exists using Business Data Connectivity Services (BCS) and Web Services, especially with SAP: Configuration is quite complex, at some points programming is required and – it still remains “external” data. That means, not all SharePoint list features are available. And your SharePoint users will need SAP licenses. But what about connecting SAP (and almost any other) data directly with NATIVE SharePoint lists, e.g. contacts, tasks, events or custom lists in just a few minutes without any coding required to keep the data in sync. Views (global and personal), sorting and grouping, filters, mobile access. Lookups from other lists can be created as usual. SharePoint search is fully supported. All list types are supported: Contacts, tasks, events, custom lists etc. You can take the SAP data offline via Outlook and / or Workspace, e.g. in Outlook contacts. You can add additional SharePoint-only columns or attachments to the external data: Documents, comments, ratings, tagging or other Web 2.0 content. List workflows (SPD-, VS- and Nintex-based) and notifications per RSS or email can be used to take business actions in SharePoint, when external business data records are changed in SAP. Easy migration from SharePoint 2007 to 2010 to 2013: All settings are kept working. SAP data is available for SharePoint enterprise metadata management (metadata assignment, social tagging, content categorization) to use with the Knowledge Management and Social Networking. 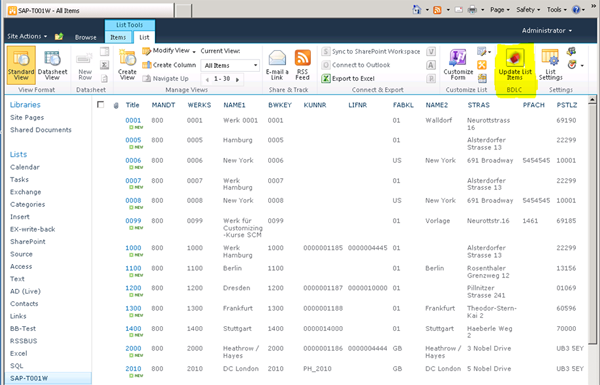 The data can interact with any list-related 3rd party SharePoint add-on. SharePoint users do not need any SAP licenses, as users are just working with an up-to-date copy of the SAP data. You will find more information and free download of the tool in this Integration Tools Directory.